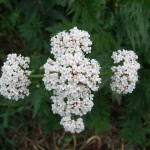 These photos were taken during the Canada Day long weekend. 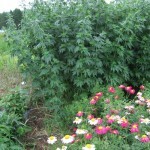 There had been incredible growth in the food forest, both food forest plants and grass included. 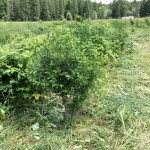 The 3×3 foot landscape fabric squares around each tree offered good protection for individual trees. 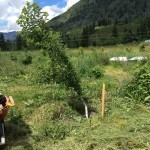 We spent a lot of time weedwhacking, bushhog mowing and hand weeding, to provide more visibility within the food forest. 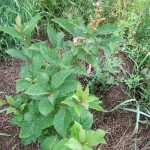 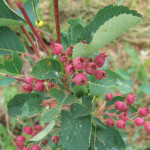 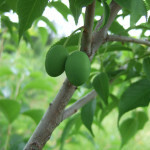 The choke cherries were developing fruit but bowing under the weight – they will need a pruning. 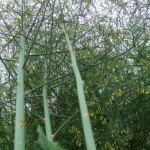 The asparagus appears very healthy and tall, despite competition with grass in their beds. 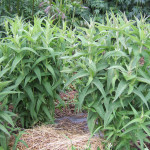 In the herbaceous bed, the motherwort was towering over everything else- standing nearly 7 feet high! 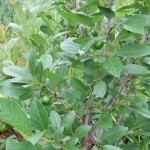 Species we noticed beginning to fruit were: plums and cherry plums, currants, haskaps and saskatoons. 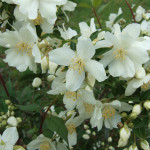 To find out more about Clear Sky Meditation Centre, visit www.clearskycenter.org. 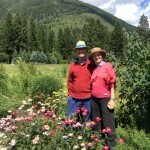 Our Dharma Teachers Doug Duncan and Catherine Pawasarat enjoy the herb garden. 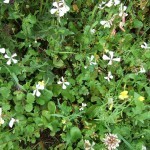 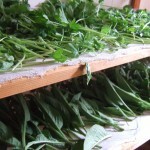 Herb and vege mix scattered in the food forest – lots of arugula is visible. 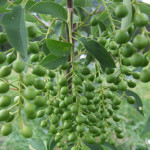 weedwhackers help… caragana supports a plum tree by fixing nitrogen. 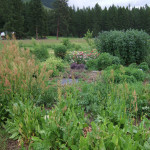 central herb garden. 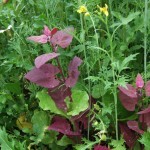 Sorrel in the foreground. 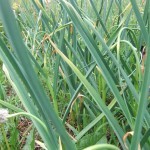 Still growing smaller amounts fo heritage garlic within the food forest.